Vettel new rear wing and exhaust.....Kimi old still. 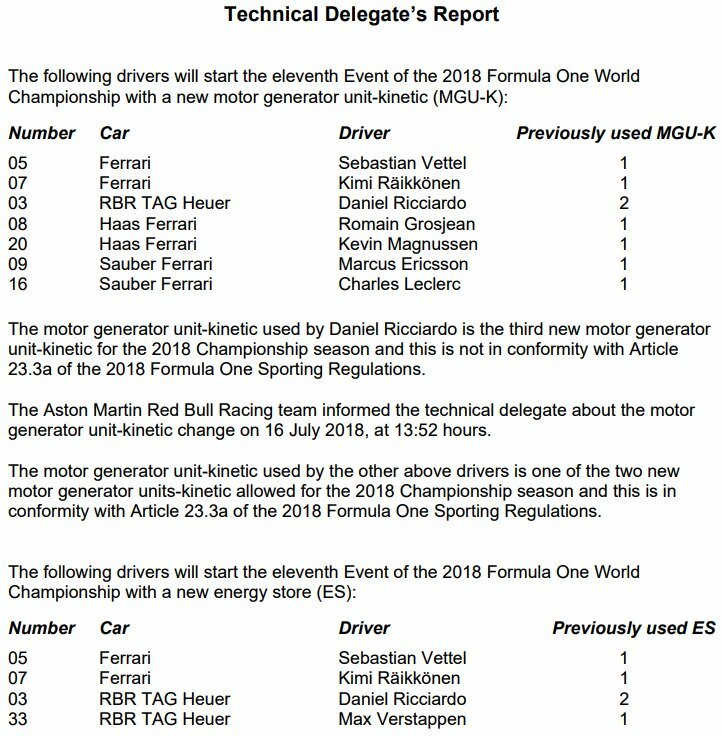 Ricciardo to take grid penalties.....start at the back of the grid come race day. 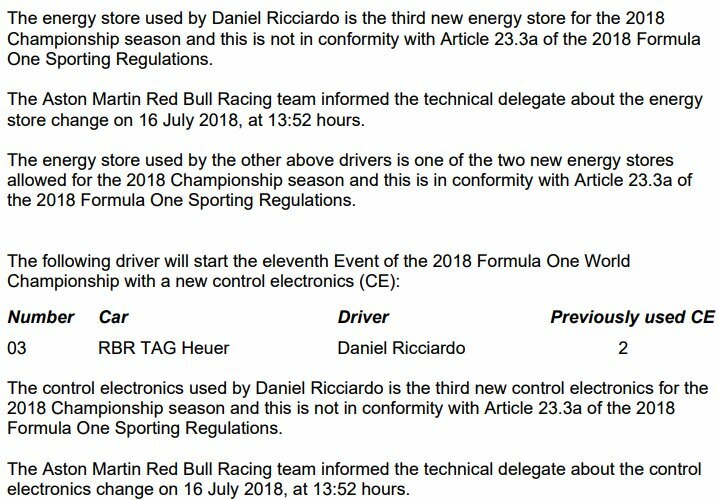 NEW Energy Store: Vettel, Raikkonen, Ricciardo and Verstappen. Last edited by jgonzalesm6; 20th July 2018 at 09:55. Vettel with softs 2 tenths behind Ricciardo who was on Ultrasofts. I don't want to get cocky but it's looking good. Ferrari's fight is with Mercedes not with Red Bull, although I won't mind Mercedes fighting it out with Red Bull and Ferrari triumphing them both with China esque gap. If it's a wet satuarday I hope the team is treating FP1 as friday and FP2 as saturday because they better get the dry setup right today. It's not looking too bad. The cars, what I could see, have good traction out of T2, T6 (especially these two), T8 and through the Sachskurve. It look fairly planted through the last corner as well. RBR seem good as well as they always seem to be able to come straight out of the box and be less affected by a difficult track than the others. It feels we're neck and neck with Merc and much closer than two years ago. Did we use the US at the end without pushing? They sure didn't show the Ferraris much in FP1. No.We didnt use the ultras AT ALL!!! Good then. I think the gap (Pirelli not bringing the super soft) can play into our hands sometime during the weekend. @Gianludale27 : " During the first part of FP1, Seb tried a new package, with a new configuration of the wastegate pipes (now above the main exhaust) and a new rear wing (with a modified leading edge). Kimi used the old package"
It looks like that lower wastegate pipe doesn't go anywhere. Wonder if it does anything? 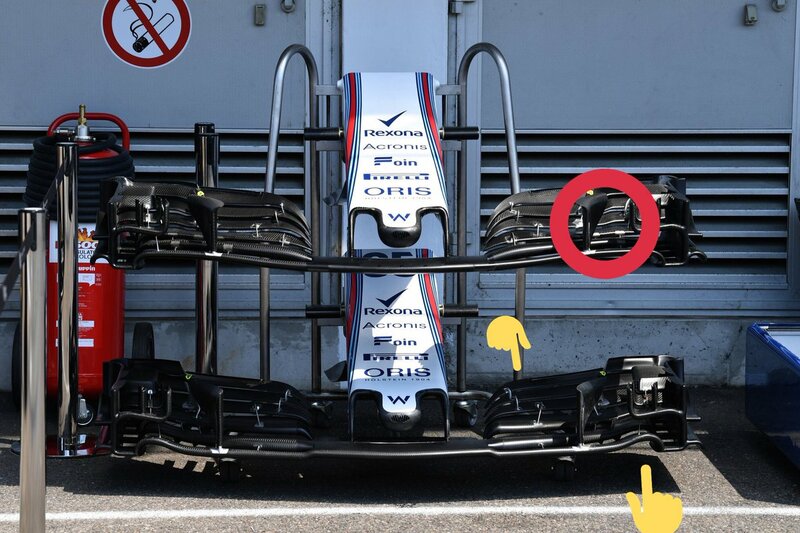 Maybe by using just one they get a stronger air flow to the bottom of the wing? Guess we aren't allowed to celebrate winning at a track which was dominated by one team for the past 4 years. Cool story Lewis. .25 down on ultras?? anyone has any info regarding this? If anything, Hamilton tanking his start showed weakness. Running from the post race interview and suggesting Ferrari hit him on purpose showed weakness. Bottas doing the same times on Softs, we looked faster than Ham on US. How about Kimi on Softs ? Kimi doing consistent 1:18.3-4 times for the past 4 laps. We did plenty of laps. Usual Friday? Nothing to be worried? After Bahrain I feel that I have a pretty good picture of where every front-runner package is going to be strong. 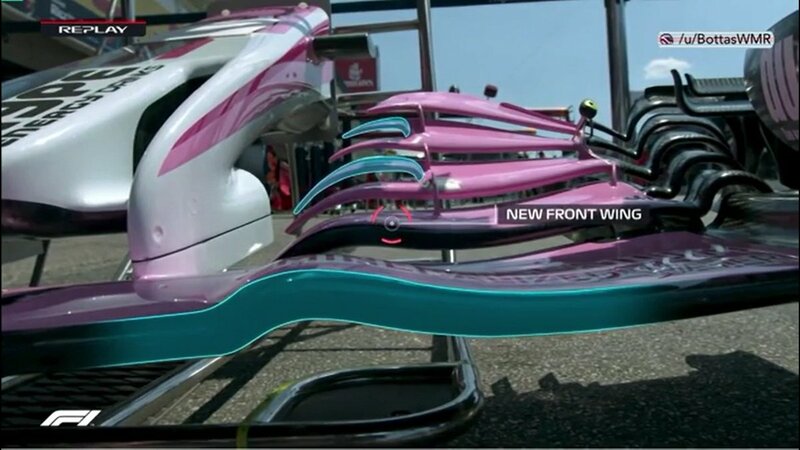 But here at Hockenheim I have no clue so I'll leave the in-depth speculation alone this time. But the long run pace looks good, can't say it doesn't. But for to really benefit from the US I hope it's a little bit cooler on sunday. If it's as hot as today they will overheat. That makes it hard to choose the best tyre for Q3. If it rains tomorrow it should be cooler on race day. But if it rains tomorrow qualifying will be a lottery. Sore loser and a sore winner tbh. but hey, he should be happy now that his #2 muppet Bottas has been signed to help him all next season. 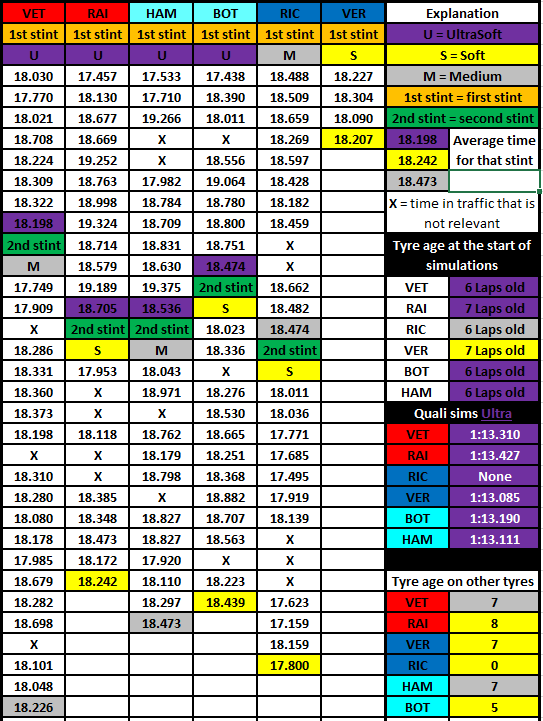 It's quite easy to predict, In Germany Mercedes and Ferrari will fight it out with Mercedes having a slight edge at the moment, Red Bull will fade away tomorrow. Red Bull will fight for 5th and 6th in Budapest with a Ferrari front row lockout. Red Bull will be the best car in Singapore but Vettel will grab pole just like last year.